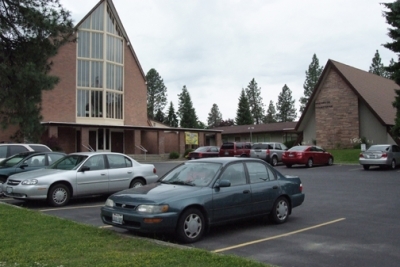 Northside Learning Center Preschool is located in north Spokane, in the Northwood Presbyterian Church, but is not church affiliated. The school has five large classrooms located on the main floor and each has large windows, creating an airy, light environment allowing the children the pleasure of seeing the seasonal changes throughout the year. The large size rooms provide the children important space for movement and play. The classrooms are clean, pleasant, well-equipped and well organized. Unlike many preschools that deal with only language or social development, the Northside Learning Center Preschool effectively covers all developmental areas by employing thematic teaching to create a learning experience throughout the morning. Each of the classrooms is set up and equipped as one activity center. Your child will rotate with their teacher and classmates to the five different centers during the morning. Each of our teachers follows a scheduled rotation and the classes spend approximately 45 minutes in each of the centers. Rotating to the different centers and having a complete change of activities and materials to explore keeps the children excited and interested throughout the 3-hour morning. It's been proven that rotation and variety of activities and materials account for improved learning, and greatly enhance the education experience for the child. There are qualified, experienced teachers on staff for each session. The children are divided into classes, usually within 6 months of each other in age, and stay with the same teacher and class for the entire school year. Our teaching approach is to make examples of stimulating, visual, and solid concepts for the pre-schoolers. By doing so, the child, as well as the teacher, experiences success and confidence. The child develops the sense that "I can do it". Social development, art and creative drama receive the same priority as math, reading readiness and language. A high degree of consistency, quality, and professionalism is provided by the staff at all times. We receive high praises from parents for the quality and expertise of our teachers. Remember, your child will be introduced to materials and will work only in those areas that are appropriate for his or her age and level of abilities. To be eligible for enrollment, your child must be at least three years old as of September 30th and must be totally toilet trained. The qualifications vary with some teachers having over twenty years experience, and/or a degree in Early Childhood Development or Elementary Education. Lesson plans are developed by the owner/director, who has a degree in Elementary Education with a major in music and a minor in science, and the school director who has Early Childhood Development from SFCC. You will receive a "Unit Letter"at the beginning of each new unit. Parents may wish to extend the monthly theme at home. Also, contained in that letter will be any important dates to remember and upcoming special events. Unit letters and special info will also be posted under the "Parent Info" section of this web site. If your child is ill please, call the school. [328-2002] When you anticipate that your child will be absent for a prolonged period, please, call the preschool. If it becomes necessary to withdraw your child for any reason, you must notify the preschool in advance so your child can be withdrawn and no monthly fee will be charged. Should you desire to re-enroll your child, you must call again to be sure there is a place available. No places are held without payment of the monthly fee. NO MAKE UP CLASSES ARE GIVEN FOR ABSENCES, NOR ARE ANY PARTIAL REFUNDS OF FEES MADE FOR ABSENCES DUE TO ILLNESS OR VACATIONS. Snack time starts at 10:25 a.m. each day. Parents provide snacks on a rotating basis for the class; a monthly snack sheet is posted in each room. The teacher will send a "snack reminder" to you the week before your scheduled time. Snacks should be kept simple, nutritious and must be store packaged, with an ingredients label. Sorry, no "homemade" snack items are excepted. EXCEPT for birthdays, we ask that no sweets be served. The school provides juice at snack time. No gum is allowed at the school. Birthdays can be celebrated at school during snack time. Please, NO CUPCAKES. The area bakeries make them with about 2 inches of frosting and the dye stains terribly. If you wish to provide birthday treats, please let the teacher know in advance which day you will be bringing special treats. Lists of all families enrolled are available to the parents at the beginning of school. If you prefer that your name not be on this list, please let the director know. Parents may contact people on that list if you would like to form a car pool. If you need our help, let us know. Please, send a note if you form a car pool, listing the parents involved and days your child will be picked up by someone other than yourself. If for some reason this should change, send a note for that day to advise the teacher. Children are given time for Show and Tell on the first school day of each month only. We prefer this not be a toy, but some other object of interest, such as a shell, a bird nest, a letter, pictures, etc. No toy weapons are allowed in school. Send items in a bag labeled with your child's name. Dress your child for COMFORT, PLAY AND THE WEATHER. Children must wear sturdy shoes for play. No open toed sandals, jellies or snow boots, please. Children wearing inappropriate shoes will be sent home. Art activities can be messy and although paint smocks are used, stains may happen. Please label your child's coat, sweater, boots, cap, and mittens with his or her name. Each teacher has a specific coat rack for her class. No corporal punishment of any type is ever used by any member of the staff. No child is ever isolated from a class or teacher. Control and discipline is maintained in school by using sound classroom management techniques. Your child will be treated with respect, consideration, and understanding.